Alexandrite is a gem that exhibits an amazing property. It appears red in incandescent light and green in sunlight. Incandescent light and sunlight both appear white when we look at them but, as Alexandrite demonstrates, not all white light is the same. Differences in white light sources can have a profound effect on how we perceive an object’s color. The Alexandrite Effect is a perfect example. 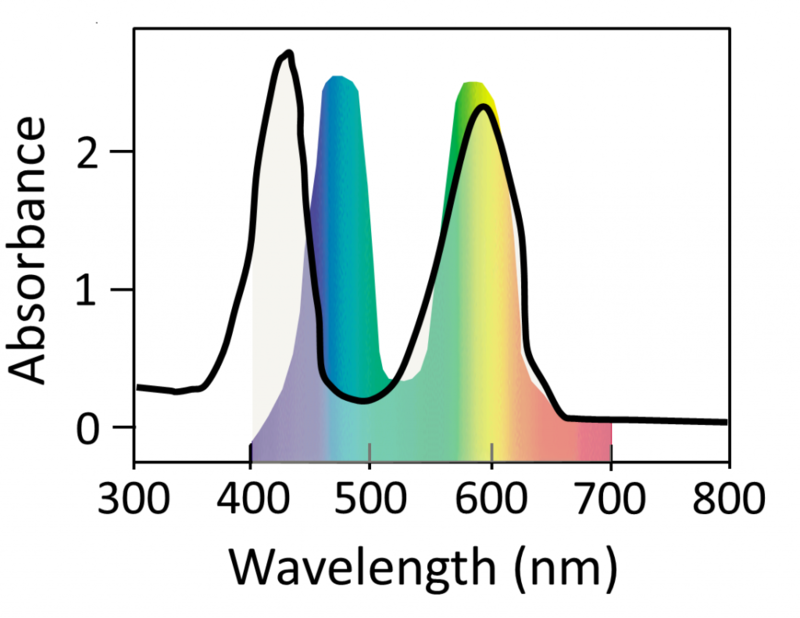 Blue, green, and red light are defined by single, specific wavelengths of the electromagnetic spectrum (~470 nm, ~540 nm, and ~650 nm, respectively). In contrast, white light is not a single wavelength. It is the sum of multiple, distinct portions of the visible spectrum. Just as many different numbers can be added together to reach 100 (50 + 50, 33 + 67, 99 + 1, etc.) there are many ways to add colors of “pure” light to make white light. One of the most common man-made sources of white light is black-body radiation. Metallurgist produce white light via black-body radiation when they heat metal in a furnace. Similarly, incandescent bulbs generate their glow by passing current across a metal element until it heats up and radiates. Yet, while black-body radiation is an effective means of producing white light, it is very energetically inefficient (most of the energy input is used to produce infrared light/heat). A much more efficient means of creating white light is to combine a few specific wavelengths of the visible spectrum. The color combinations that produce white light are depicted in the CIE color diagram below. The colors along the rounded edge of the shape (everything but the bottom, straight edge) can be thought of as “pure” because they’re defined by a specific wavelength of light between 380 and 700 nm. All colors inside the border as well as along the bottom, straight edge are created when two or more “pure” colors are combined. White light is at the “center” of the CIE diagram (x = 0.33 and y = 0.33). I regularly referenced this diagram while researching organic light emitting diodes (OLEDs) because molecules emit specific wavelengths of light and are not broad emitters (like heated metal). To make an OLED TV that displays most CIE colors, including white, manufactures incorporate blue (x = 0.1666, y = 0.0089), green (x = 0.2738, y = 0.7174) and red (x = 0.7347, y = 0.2653) emitting molecules in the screen design. To make an OLED screen appear yellow, both the red and the green molecules must be electronically excited and emit at the same time. The resulting color is entirely dependent on the proportion of red and green molecules excited. Exciting more green than red molecules makes the screen appear greenish-yellow. Exciting more red than green molecules makes it appear reddish-orange. 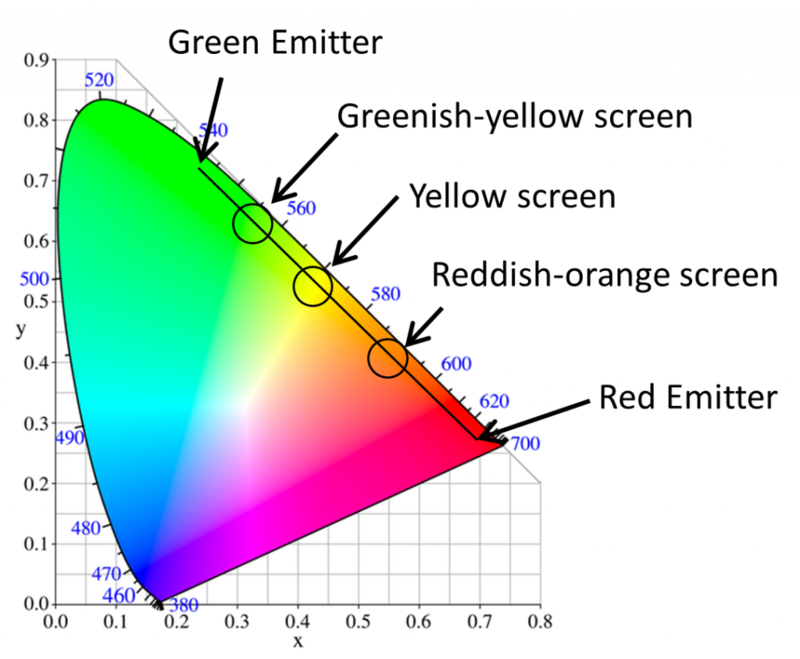 If we want the screen to appear yellow, then the intensities of the emitting red and green molecules must be balanced. These “summed” emission can be depicted by drawing a straight line between the red and green points on the CIE diagram (image below). Similar strategies are used to generate different types of white emitting OLEDs. Every day, ambient white light is sometimes created by summing the emissions of blue and yellow emitting molecules (image below left). White pixels on OLED TVs are created by summing red, green and blue emitters (image below right). We perceive any light source emitting these two color combinations as white. However, illuminating an object, like alexandrite, under these various white light sources can uncover really interesting color chemistry. Chrysoberyl is an oxide with the formula BeAl2O4 which is typically colorless or yellow because it absorbs little to no visible light. Alexandrite is the rarest and most valuable member of the chrysoberyl family and is formed when some of the Al3+ is replaced by Cr3+, either naturally or intentionally. The small amount of Cr3+ impurity in Alexandrite (<1 %) is directly responsible for its interesting colors. 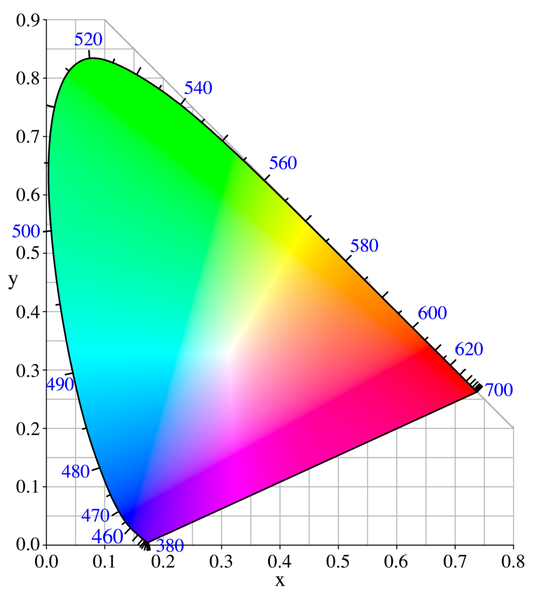 This coloration can be depicted via the absorption spectrum below. 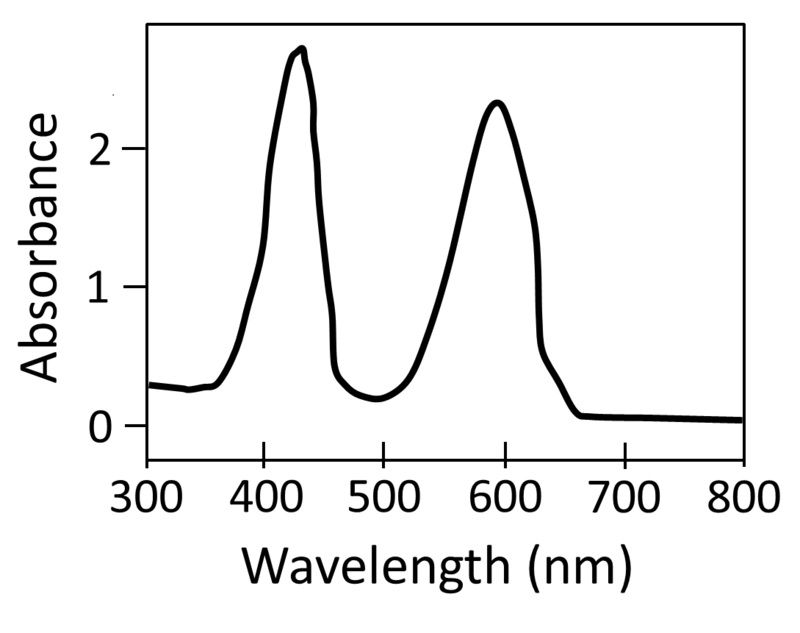 This absorption spectrum is a graphical depiction of the amount of light absorbed/removed/not transmitted (y-axis) versus the wavelength of light (x-axis). Unlike undoped chrysoberyl, Alexandrite has two strong absorption peaks in the visible spectrum at ~400 nm and ~600 nm (for those of you crystal field junkies, the peaks at ~400 nm and ~600 nm are assigned to the 4A2 to 4T1 and the 4A2 to 4T2 transitions of octahedrally coordinated Cr3+). Conversely, it has two low absorptions, or high transmission windows, in the blue-green (470-520 nm) and red (>650 nm) portions of the spectrum. When Alexandrite is viewed under uniform white light (the sum of ALL visible wavelengths of light) the blue and yellow portions of visible light are absorbed and the blue-green and red portions are not (below left). This gives the gem a purple-grey–the sum of blue-green and red emission–appearance (below right). But, as I said above, not all white light sources are the same. Even though sunlight appears white if you look directly at it (don’t look directly at it! ), it actually has a larger contribution from the blue and green portions of the spectrum. Under sunlight, Alexandrite absorbs yellow and blue. Yet, since more green and blue light is transmitted than red light, the gem appears blue-green, as depicted below. In contrast, when Alexandrite is placed under incandescent lights or a candle, which have a larger contribution from the red portion of the spectrum, the gem appears red. Based on the absorption spectra above, the Alexandrite effect could be greatly amplified if we viewed it under a two-component, white OLED (or a comparable two-color emitter). We could produce a white OLED by combining light from a ~490 nm and a ~590 nm emitter. When viewed under this light source, I’d expect Alexandrite to be a very sharp cyan color because the amber component (590 nm) would be entirely absorbed. The relatively narrow emission of molecular species (50-100 nm) would also likely result in a much sharper color for Alexandrite than what is observed in the sun or under incandescent lights. If anyone has an easy way to perform this experiment, I would love to see the result. Farrell, E. F.; Newnham, R. E.; The American Mineralogist, 1965, 50, 1972-1981. Liu, Y.; Shigley, J. E.; Fritsch, E.; Hemphill, S.; Mineralogical Magazine 1995, 59, 111-114. In case anyone is interested in seeing the Alexandrite Effect in person, you can get a 1.5 cm Alexandrite gemstone on Amazon for $35. I just received mine in the mail yesterday and proceeded to walk around and view it under every light source in my apartment. Too expensive, I need a cheaper source of Alexandrite. You can get a shovel for ~$10. Then all you need is a lot of motivation and spare time. Except that that’s not alexandrite; it’s synthetic corundum (as it states pretty explicitly). Alexandrite is a form of chrysoberyl, which is a different mineral. If you just want to see the color change effect, then “zandrite”, which is rare-earth doped glass, is another cheap possibility. If you look around, it’s possible to find small genuine alexandrite gemstones on ebay, but the color change is typically not great unless you pay big bucks. We are writing an educational article on color temperature and the color of alexandrite for our upcoming coloured stone web-portal. Can I use your fantastic images if I give you due credits and link the blog? I am positive of a few things..they are not a treated mineral. The color shift goes from a deep aqua color to a emerald green in natural light and under incandescent light they are a deep reddish purple. I have done a significant amount of research and due the deep green they can reach I’m almost positive they are not conundrum..the largest is 33 mm long and .5 inch wide. This falls right in line with the dimensions from alexandrite proper as found in nature.and when grown through the flux method. I believe that is what I.have. flux grown synthetic alexandrite. Is there a way to find out for certain.? Thanks for the clear explanation of the alexandrite effect. I have a ring with a synthetic alexandrite and recently noticed that it looks completely black under some white LEDs. I’m guessing it has to do with the wavelengths of light being emitted by the lights, but would love a more specific explanation or confirmation. We can expect a phenomenal mixture of the chemistry discussion and news. Now it’s additionally, this blog is partnered with The Royal Society of Chemistry. To say it has credentials is an overstatement.